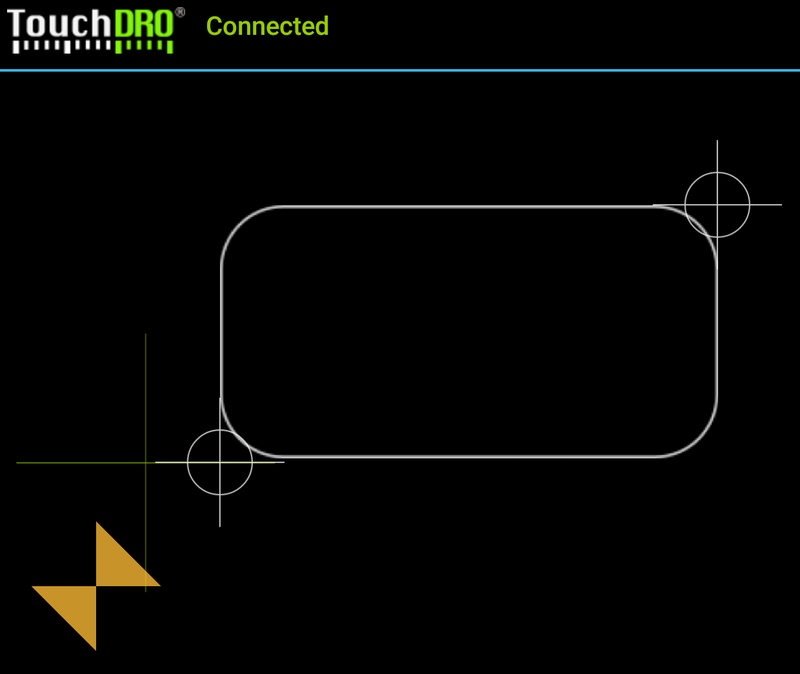 In the last post I showed some of the updates coming to the next version of TouchDRO. The new version will include a lot of tweaks, UI changes and improvements aimed to make the DRO even more flexible and efficient to use. 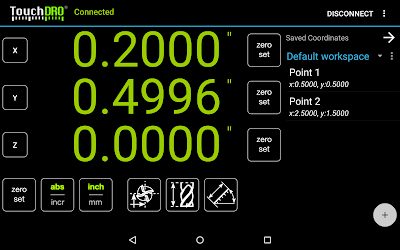 As is, TouchDRO can already do much more than and old-school DRO, but next version is getting a number features that will push the limits of what you can do with a non-CNC mill or lathe. 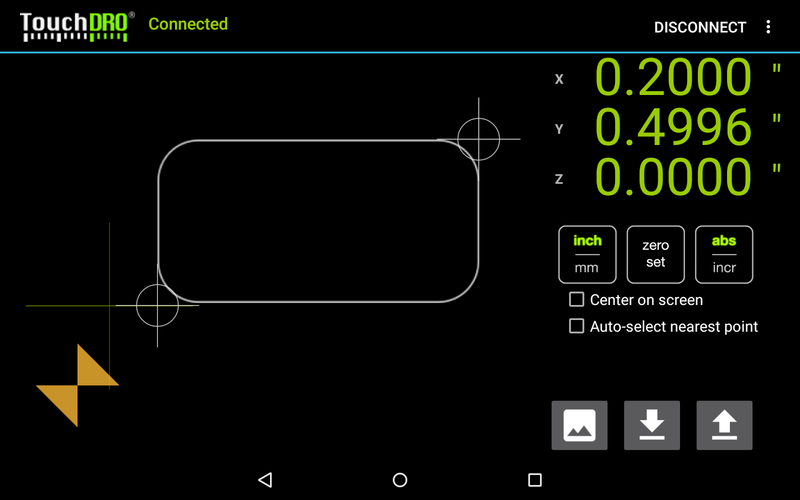 One of those features is the ability to set a background image in layout view and use the mill or the lathe to trace the contour. From time to time I find myself needing to machine such things as pockets or complex contours, etc. In such case I would normally scribe the layout and try to trace it with the mill. This approach has a few problems. For example the scribed lines and hard to see at some angles, they get covered with swarf and, the end mill obstructs the view, so one needs to constantly brush off the chips and resort to contortionism to make sure that the back of the mill stays between the lines. 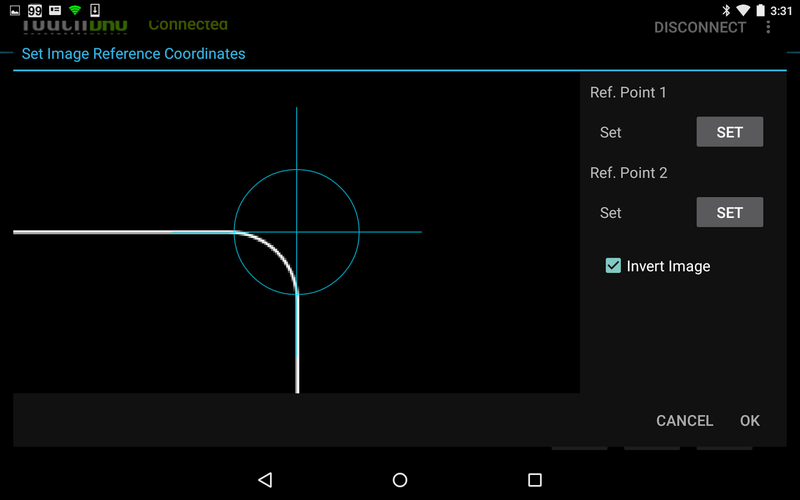 My solution is pretty simple: instead of scratching the layout onto the part I can my DRO and trace a virtual layout. 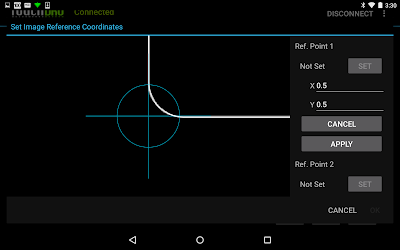 This is much easier to do due on the high resolution TouchDRO screen with the view zoomed in up to 10x than using scribe lines. There will be a few different ways to do this in the next version, so let me explain the most basic method of using an image as a background in the Layout View. For the purpose of this demo pretend that I need to machine a 1.00" by 2.00" pocket with rounded corners spaced 0.5" from the front and left edges. 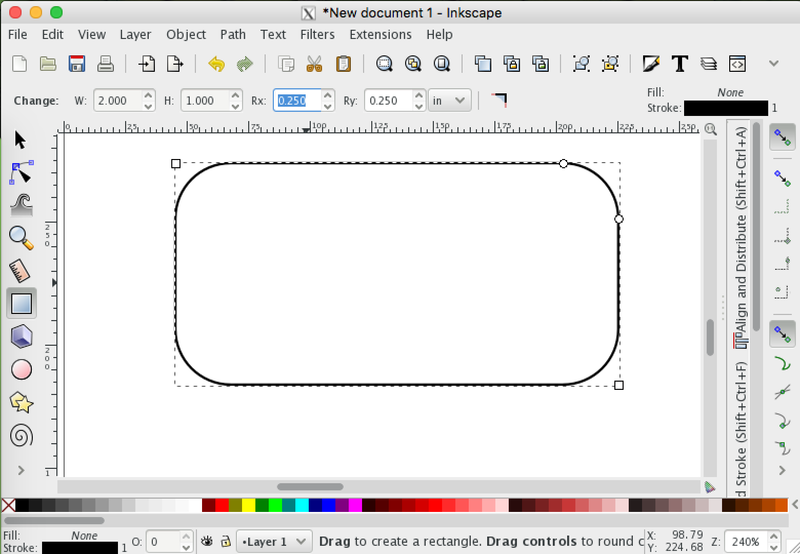 To create the layout I will use Inkscape to draw a simple 1 inch by 2 inches box, export a PNG file and transfer it to the table. 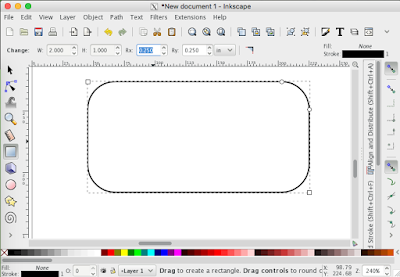 Inkscape is a free vector drawing software. There is no particular reason for using it, and in practice any vector graphic or 2D CAD application can be used. Now let's switch to TouchDRO. In order to confirm that my layout ended up in the right spot I'm adding two points to the workspace, one at (0.5",0.5") and another at (2.5", 1.5"). If everything goes well those points line up with the corners of my rounded box. With the points added it's time to switch to the Layout View and set the background. Pressing the image button in the lower-right corner brings up the "Select File" dialog where I'm going to navigate to the folder where my PNG file is and select it. 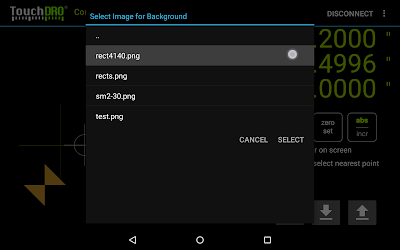 The next screen will let me set proper scaling and position for the image. 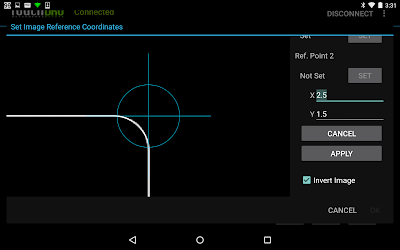 The idea is rather simple: I need to pick two points on the drawing and tell the DRO what their coordinates need to be. 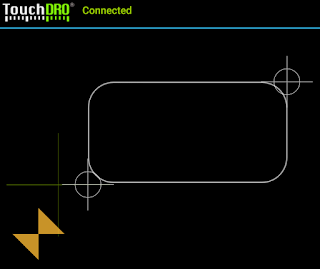 TouchDRO will do the necessary math to scale and offset the image on screen. I know what the desired dimension of my box is (1 by 2 inches) and I know where it needs to be positioned (0.5" away from the front and left sides), so I'm going to pick lower-left and upper-right corners as reference points. 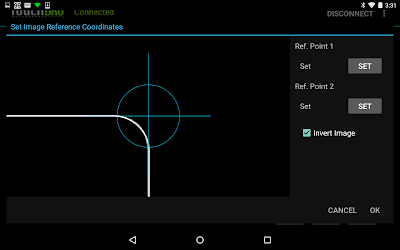 In the app this is one by moving the image so the first reference point is under the cross hairs and entering the desired coordinate. The process for the second point is basically the same. 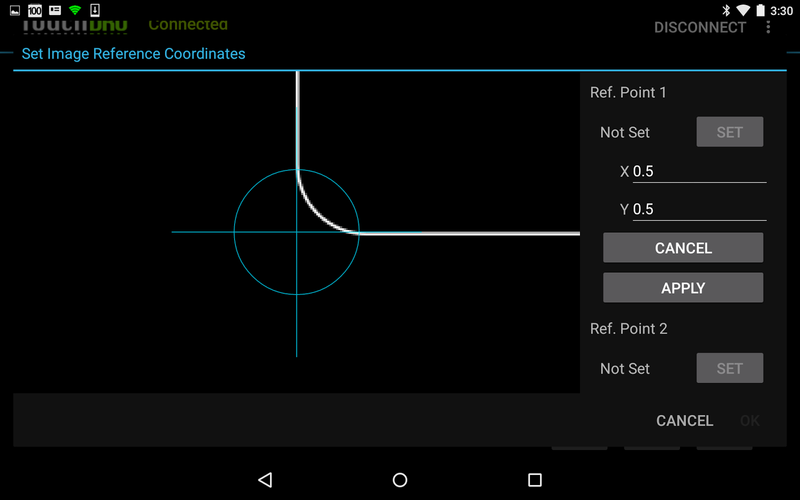 In the Layout View I can confirm that the rectangle lines up with the points I created earlier. Now it's the matter of milling out the material inside the box to a proper depth. This is obviously a very basic demo, but it should give you an idea of what this feature can do. The layout can be a lot more elaborate, and can be combined with other workspace functions. As you can see, with TouchDRO and some imagination you will be able to greatly expand what can be done on your manual mill or lathe. 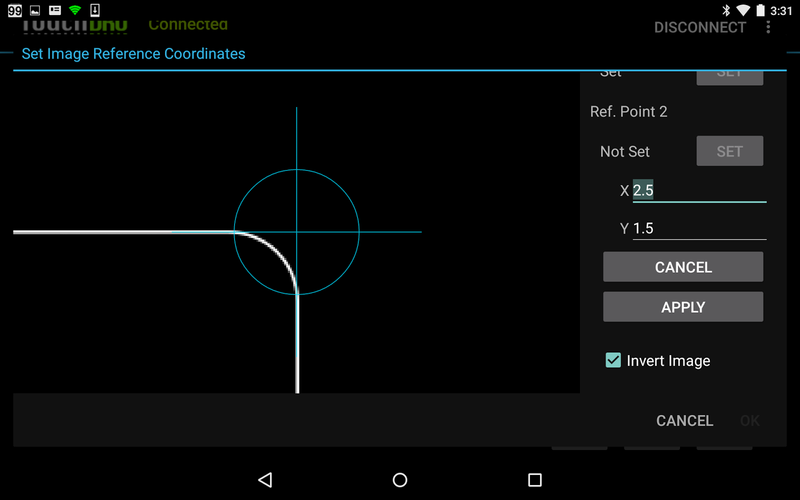 Furthermore, using a virtual layout will likely be more precise than scribing the layout on the part. First of all, drawing the layout in a 2D CAD application will be more accurate and less error prone. Second, Layout View can zoom in up to 10 times, so following the lines will be more accurate. 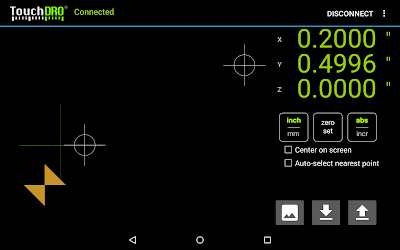 Finally, it's much more convenient to look at the 7" screen than trying to see the scribe lines on the part being cut. Finally, when multiple identical parts need to be made, this will be heaps more efficient and repeatable than scribing each part individually. I hope you found this demo useful and please feel free to post any feedback or suggestions. I will be posting more feature highlights as the app gets closer to be ready for Beta testing, so please follow TouchDRO on Facebook. If you're interested in joining the Beta program, please join the TouchDRO Beta Users Google+ community and opt into the beta program. Are you planning to add a tool path for this layout after selecting the proper tool. But so far it looks very useful. Keep it up.. I love it! AvE has a video where he uses a cell phone mounted on the mill to accomplish sort of the same thing. This solution is much cleaner though. When can we expect to see the beta so we can play with it ourselves?